ARRIVALS: Indra Regent, the two star plus property in Colombo is celebrating two years under a new management. General Manager of the hotel located in Duplication Road Colombo 3, Lal Matharage said that tourist arrivals to the City have not declined and they were maintaining over 85 percent of occupancy year round. One of the oldest hotels built over 40 years ago, has 29 large rooms and two suites. "We would be soon adding new features to the business Centre, and for conference facilities that could accommodate nearly 100," he said. All rooms are air conditioned with hot and cold water, cable TV, internet connections and most of them have tea, coffee making facility as well. He said that in addition to the business travellers there are walk-in guests who stay around two days. "The management is now looking at investing in another hotel in the hill country so that they could offer two destinations for their clients," he said. The senior staff in the hotel, including Sales Manager, Ranjan Benjamin, Executive Chef, Peter Pietersz have all been working in local and overseas five star hotels. Indra Regent, the first hotel to introduce Karoke to Sri Lanka said that they have also refurbished this Hot Rock lounge to accommodate more than 50 guests. "In addition the hotel also has a Tulip Thai restaurant, Rendez Vous Coffee bar, saloon, gift shop, in-house laundry and would soon introduce an authentic Indian restaurant. 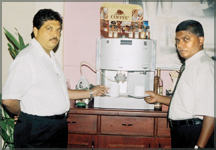 The hotel also has a special coffee maker machine which could make over 15 hot and cold flavours and this is only the second such machine installed in Sri Lanka. "We are now offering a special honeymoon package as well," he said.